My momma always said, "Life was like a box of chocolates. You never know what you're gonna get". Let me add, life is also like a stretched breadstick, crunchy and soft, you never know what's in for you at the next bite. 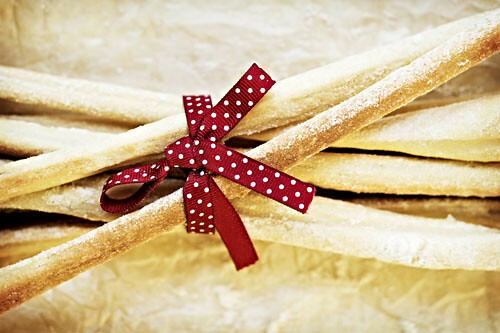 Forget the chocolate; today breadsticks - whether stretched or chubby - are, for me, the real ode to life, my New Age metaphor, the smell and memory of everything that's good in the world. 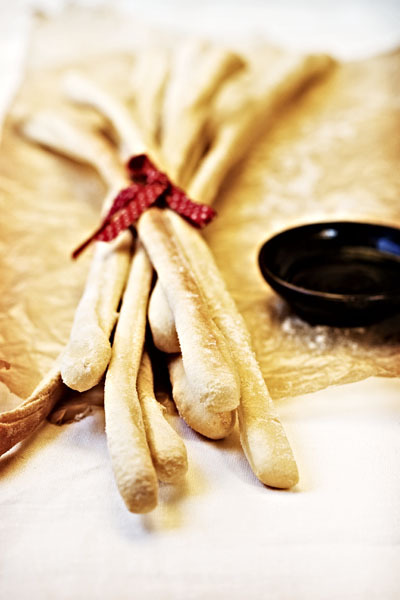 The peculiarity of these breadsticks, pulled strictly by hand, is that they're very irregular: the thinnest pieces cook quickly and become crunchy, while the thicker parts stay rather soft. Every bite is a surprise. The recipe, which I'm copying literally, is not my own work, but it comes again from the Simili sisters' book, which one can never exploit enough. May the bread be with me until yeast last. Make a well in the middle, mix all ingredients and knead for 8-10 minutes. Dough should not be too soft. Shape it into a loaf and make a rectangle about 4x12 inches out of it; keeping the shape as regular as possible, place it on a layer of semolina flour and coat the surface and the sides thoroughly with olive oil, and then sprinkle with more semolina. Cover with a bowl and let it rise for 50-60 minutes. With a chef's knife or a large spatula, cut from the short side pieces of dough about 3/4" thick; without shaking it too much, grab each piece in the middle with your fingers, and stretch it out by pulling gently and moving your fingers towards the edges as the piece gets thinner. Place the breadsticks on a baking sheet a little apart and adjust their thickness with the fingers to even it out. If you've used too much dough and the breadstick is too long, cut out the edge part, and bake the piece as it is because it can't be kneaded twice. Place immediately in the oven and bake at 390 for 18-20 minutes. Hello. My name's Forrest, Forrest Gump. You want a chocolate grissino? As a cook in the caterers in New York, I find your stretched breadsticks recipe so interesting. This would be perfect for appetizers and pasta. میشه گفت دیجی در هم بد نیست. ارائه قیمت راهبند پارکینگ به صورت آنلاین امکانپذیر نیست بی اف تی برند مشهوری در ساخت راهبده میشه گفت دیجی در هم بد نیست. بی اف تی برند مشهوری در ساخت راهبده میشه گفت دیجی در هم بد نیست. بی اف تی برند مشهوری در ساخت راهبده راﻫﻨﻤﺎي ﻧﮕﺎرش ﭘﺎﻳﺎن ﻧﺎﻣﻪ ﻫﺎي ﻛﺎرﺷﻨﺎﺳﻲ ارﺷﺪ تدوین یا نگارش پایان نامه جزء خدمات مشکوک موسسات است. در ادامه آموزش قبلی با عنوان آموزش تصویری مایکروسافت ورد راﻫﻨﻤﺎي ﻧﮕﺎرش ﭘﺎﻳﺎن ﻧﺎﻣﻪ ﻫﺎي ﻛﺎرﺷﻨﺎﺳﻲ ارﺷﺪ در ادامه آموزش قبلی با عنوان آموزش تصویری مایکروسافت ورد راﻫﻨﻤﺎي ﻧﮕﺎرش ﭘﺎﻳﺎن ﻧﺎﻣﻪ ﻫﺎي ﻛﺎرﺷﻨﺎﺳﻲ ارﺷﺪ در ادامه آموزش قبلی با عنوان آموزش تصویری مایکروسافت ورد مخزن لباسشویی ما خرابه تعمیر نمیشه. هزینه تعمیر لباسشویی در سطح تهران غیرمتعارف شده. تسمه یا گیربکس لباسشویی را چطوری تعمیر کنیم. مخزن لباسشویی ما خرابه تعمیر نمیشه. بچه ها یکی نیست یه آتلیه بارداری خوب بهم معرفی کنه ؟ قیمت مهم نیست برام . تسمه یا گیربکس لباسشویی را چطوری تعمیر کنیم. مخزن لباسشویی ما خرابه تعمیر نمیشه. برای تبلیغ بعضی موسسات ترجمه ارزان راهکار مناسبی به نظر نمی رسد. تسمه یا گیربکس لباسشویی را چطوری تعمیر کنیم.